All users of mobile aluminium towers are required to have had appropriate training for their safe assembly, alteration or dismantling. 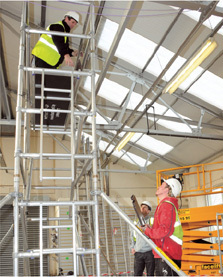 This is a requirement of the 2005 Working at Height Regulations. The PASMA course is the UK's industry standard for aluminium tower training. For more information on this and any other facelift training courses please call us on 0800 072 55 72 or click the contact button and we'll call you back. Call us on 0844 26 44 360 or click the contact button and we'll call you back. Courses can take place on your own premises or at one of our training centres, situated in Newcastle*, Liverpool*, Birmingham, East London*, South London*, Hickstead (West Sussex), Ashford, (Kent)* & Southampton. (*Indoor Training Centre).